The Boston-Edison Historic District is an instantly recognizable address in the heart of Detroit, containing over 900 homes. Most homes were constructed between 1905 and 1925 and range in size from modest two-story vernaculars to impressive mansions. Early residents of Boston-Edison included Henry Ford, James Couzens, Horace Rackham, Sebastian Kresge, and Joe Louis. 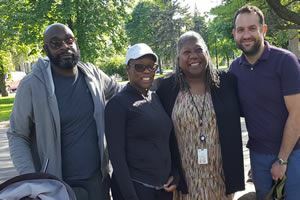 Today Boston-Edison is a multi-racial, multi-ethnic neighborhood with people from diverse occupations and professions who share a common appreciation and love of historic homes. It boasts the Historic Boston-Edison Association, the oldest continuous neighborhood association in the City, founded in 1921. Are you a resident of Boston-Edison? 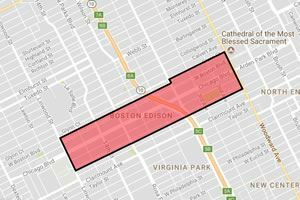 We've constructed this website to give you as much information as we can about the neighborhood, the city, and the Historic Boston-Edison Association. 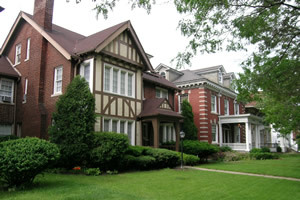 Are you considering purchasing a home in the historic Boston-Edison neighborhood? If you are, then we want you to have as much information as possible about the neighborhood. Are you just visiting Boston-Edison? We love to host visitors in the neighborhood. Whether you're coming for a formal event, just dropping by, or only visiting via the web, we've got information here for you. Boston-Edison has it all: great homes, great location, and great people. If your dream is to own an historic home, whether to live in or to renovate, this is an opportune time to buy. Houses are available in all areas of the historic district, in all sizes and styles, and in a wide range of prices. Some houses are in move-in condition. Others need owners committed to renovating them and bringing them up to their potential. Want to join HBEA? It's easy! Dues are $40 per household per year, and go toward numerous neighborhood activities. Help us preserve what makes Boston-Edison a great place to live and a historic treasure to maintain. For residents and non-residents alike! B-E in the know by reading our newsletter and receiving news and updates about events and initiatives! We need your help! Interested in participating in events or committees? Click the button below.